I didn't find any information on this on the wiki so i figured I'd add this to the Joomla! Docs. This tutorial will explain how to set up a testing server for use with Joomla! and the Eclipse IDE. 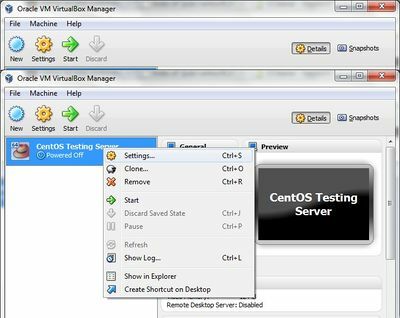 This tutorial will use the following software to give you a complete testing server environment. Do you have a website that's live and you need to constantly upgrade your website, however since your website is live, you dont want to edit the actual website, resulting in the site crashing from time to time or not working. Getting a testing server allows you to do all your testing without affecting the live server. Then you upload your completed update to the Live Server once completed. Nine times out of ten, your server is on a Linux based system, but you are not. Sometimes testing between Windows or Mac based systems and then switching over to a Linux based system can cause issues. I.e. carriage returns, etc. So your testing server should be on a Linux based system ( or whatever the actual server is ). 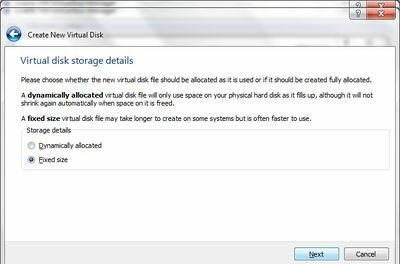 This tutorial assumes you are using Windows 7, which release doesn't matter. 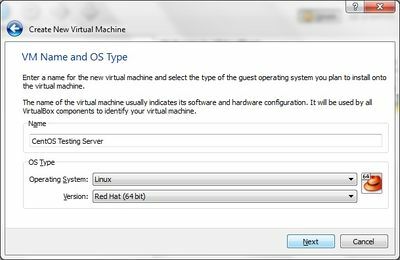 To setup the testing server, the first thing you need is Oracle VM VirtualBox. 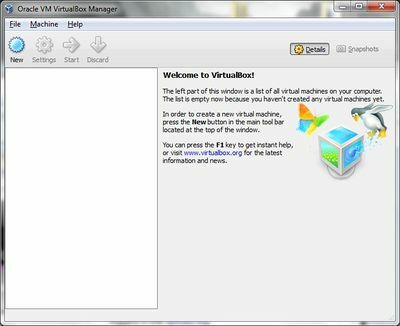 This software will virtualize another "guest" operating system on your machine while its running. At the time of writing this tutorial, I'm using version: 4.1.18. Download the version for windows hosts and install it on your computer. Your also going to need a Cent OS iso to use to install the Guest OS. 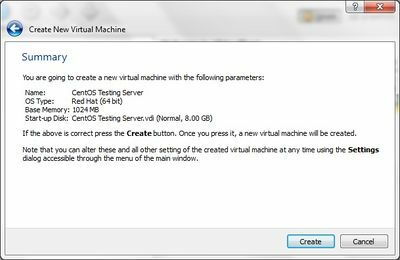 At the time of writing, the latest version of CentOS is version 6.3. The Link i used to download is http://www.gtlib.gatech.edu/pub/centos/6.3/isos/x86_64/. NOTE: this is for 64 bit computers. Alternatively, you can go to the CentOS Downloads Page and choose your download place. Click next to go to the next page. 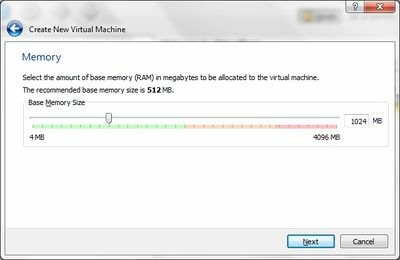 On then next page, decide how much memory to dedicate to the Virtual Machine. Try to give CentOS atleast 1gig of RAM. Note: You can do the recommended 512 MB if you want, however the CentOS installation process will be different. Click next to go to the next page. 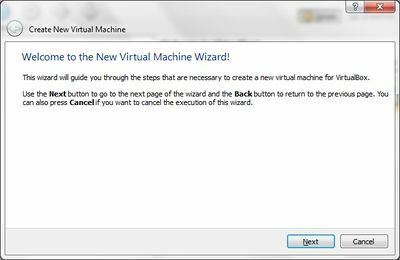 On the next page, you will click next again because we will be creating a new virtual hard drive for use with the new virtual machine. After clicking next, you will begin the Virtual Hard disk creation and you will see the screen below. 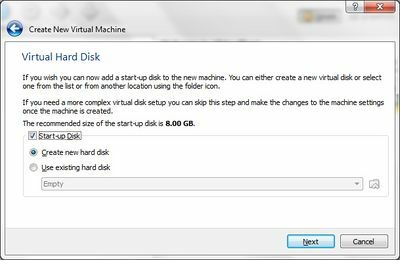 I suggest using VDI (VirtualBox Disk Image), but you can select another if you'd like. Click next to go to the next page. You will next select the disk storage details. Dynamic or fixed allocation. You can read the screen for what each does, however here a few suggestions for speed reasons. 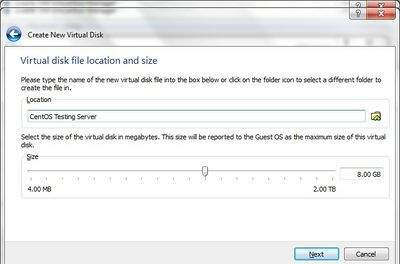 Next, your going to select the name and size for the virtual hard disk. I always name the disk the same name as the testing server and I usually use 8gigs minimum for the virtual hard disk unless i know i'm going to need more. Next, your going to put your hard disk settings to work and actually create the virtual hard disk. 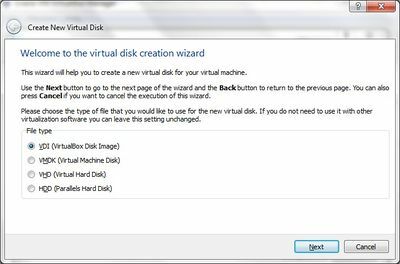 Click Create to finalize the virtual hard disk creation. 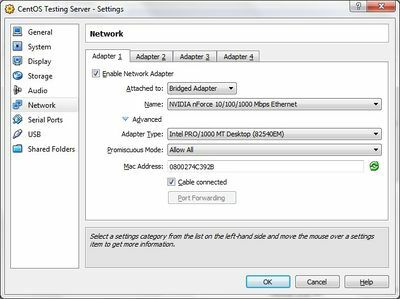 Make sure that the Adapter Type is set to Bridged so that other computers on the network/intranet/internet can interact with your VPS. 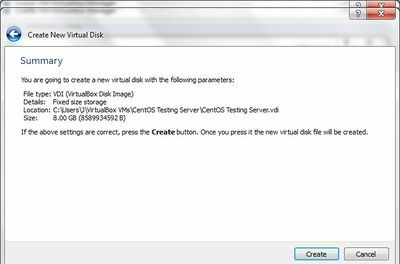 Ensure that you add the CentOS iso that you downloaded to your virtual CD/DVD Drive so that we can install to the virtual hard drive from it. Now we finally Start the Virtual Machine. Follow the instructions from this site, all the way up until 8 Quota: stop BEFORE that. So we have the Guest OS set up completely and we're looking to setup the actual web/mysql/ftp server portion. If its not on, turn on the server and login as root using the password you set in the previous section. If your going to expose your VPS to the internet, i suggest setting passwords for xampp. You can do that by executing this command. Next, Install Joomla. The one key here is to use the same database prefix as your live site, so that you can use exported sql to copy information over versus entering it all in again. Oh, before we do that, lets make the configuration.php file writeable by making the base directory writeable. See this page for help installing Joomla: Installing_Joomla! This page was last modified on 1 March 2013, at 22:58.